We are allways making App improvements and performance enhancements. To make sure you don't miss a thing, keep your Updates turned on! 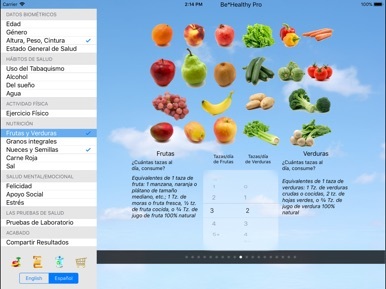 •Health Age - based on the person’s lifestyle practices compared to research findings on health and longevity. Find out how young or old they really are. •Longevity estimates are provided, both average longevity and what’s expected based on the person’s health practices. •Potential Added Years - learn how many years a person can add to their life expectancy by making needed lifestyle changes as recommended in the personal wellness report. 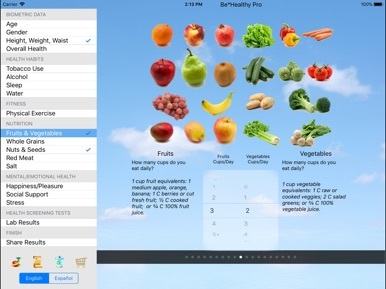 •Personalized Lifestyle Guidelines for developing a personal wellness program for a longer, healthier life. Guidelines provided for physical activity, weight management, health habits such as sleep and being smoke free, improving eating habits and mental/emotional health. •Health Tests – are optional but can be added for further motivation and guidance in healthy living including: blood pressure, cholesterol, blood glucose, BMI, percent body fat, and aerobic capacity from a 1-mile walk test. Results are compared to standards for good health. 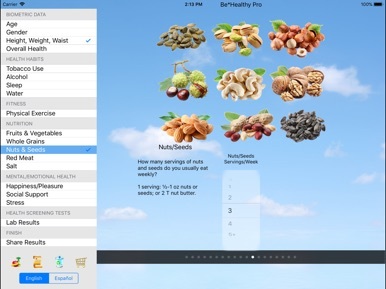 •Preventive Actions – Learn actions you can take to lower blood pressure, cholesterol levels, triglycerides, blood glucose, percent body fat, and improve cardiovascular fitness, and lifestyle. Scientific Basis: The health and longevity assessment is based on current research including Harvard’s Nurses Health Study, the Health Professional Follow-up Study, and the Adventist Health Study. Included are 14 lifestyle factors strongly linked to better health and a longer life plus 9 optional screening tests shown to be strong predictors of future health and longevity. 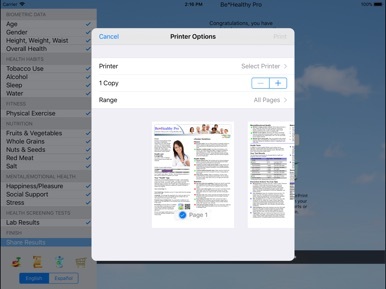 Be*Healthy Pro requires either an annual subscription which costs $149.99 USD or a monthly subscription which costs $19.99 USD and a WiFi AirPrint enabled printer (preferably one that supports duplex printing) to print reports with the data you enter. Your account won't be billed until the free week trial period is over. Print & email subscriptions automatically renews unless auto-renew is turned off at least 24-hours before the end of the current period. Your account will be charged for renewal within 24-hours prior to the end of the current period. You can manage subscriptions by going to the user's Account Settings after purchase. Any unused portion of a free trial period will be forfeited when the user changes a subscription. This exciting game for kids will help teach letter, word, and color recognition. Each round has a fun reward system at the end, to keep children excited and playing. Even the shuffling screen contains a fun "star popping" mini-game, to help develop finger dexterity while they wait!